In Insight, most display settings are grouped in generic and reusable "Classes", which you can create, view and/or edit in the Class tab in the Control Panel. 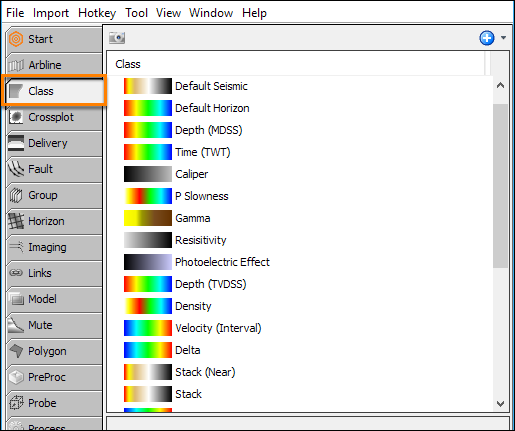 Every class comprises a colourbar, minimum/maximum interpolation, wiggle and track view settings. You can associate a class with multiple items and these items will always share exactly the same display parameters. For instance, you may want to associate the P-Impedance class with a well curve and a volume (from an inversion). By doing this, you can do an apple-to-apple visual comparison between the data. In addition, when you update the class settings, display of both the items will be updated simultaneously. This helps to save time when you have many items that share the same class settings. Insight comes with many built-in classes with default colourbars and appropriate minimum/maximum interpolation ranges for various standard data types. To understand how we name our colourbars and a graphical representation of each colourbar,see Colourbar Naming Convention. However, it is possible for you to create new classes in the Class tab where you can adjust the settings (see Creating a Class). Tip: Whenever you load a dataset into Insight, the system will assign a class to it by default (see Insight's Automatic Volume Class Assignment). However, you can still change the class or edit the class settings. Select a class in the Class tree. The Details Panel of the class is displayed. G — Track view settings for display of well curve that is associated with the class (see Defining Track View Settings).